I feel like everyone's mom or grandma when I say "technology is WILD for the kids these days" – but it's true! Seems like every single day there's an undiscovered iPhone user hack or screen time that changes the way people use their devices. But we rarely see it quite as sneaky (or spine-tingling) as this one, which uses the Airpods Live Listen feature. This tool was originally designed as an accessibility function for those who need to enhance voices, but as Twitter user @noldcrndo pointed out it can also be used to hear conversations in a room where you left your phone behind. 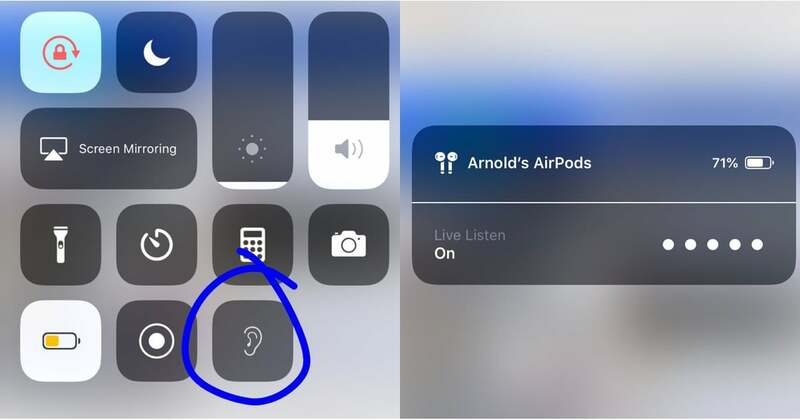 Simply go to your settings, select "Control Center," customize your controls to include "Hearing," and choose "Live Listen." Now, I love to eavesdrop as much as the next person (and judging by what I hear them whispering right now, probably more ), but I'm definitely not endorsing the use of Airpods in this way. In fact, I have mixed feelings about this hack, and based on the reactions on social media, I'm not alone. Ahead, see what people are saying about this feature, and let's leave the super-sleuthing to the professionals, shall we?